Are weeknight meals getting boring or unhealthy? 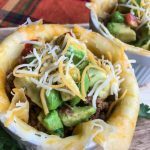 I’ve got a delicious low carb ground beef recipe that you won’t want to miss: Keto Taco Cups with Avocado Salsa. It’s an easy Keto friendly recipe that is easily one of my favorite healthy meals under 30 minutes because the whole family loves it! Trying to eat healthy can be incredibly hard. I hate feeling deprived because I’m totally that kid that wants to do something 100x more when they hear the word don’t. It’s why I don’t diet. Anything I lose in the few days I manage to stick to it, I gain back as soon as I fall off the wagon. So instead, I try to find balance with what I eat. If you’re unfamiliar with Keto taco cups/Keto taco bowls/Keto cheese cups – they’re an awesome way to make tacos lower carb. Essentially you replace the tortilla (higher carb) with cheese (lower carb.) I use cheese on my tacos anyway so this is kind of a no-brainer recipe for me to add to a Keto dinner menu. Especially when you’re looking for 30 minutes or less meals. 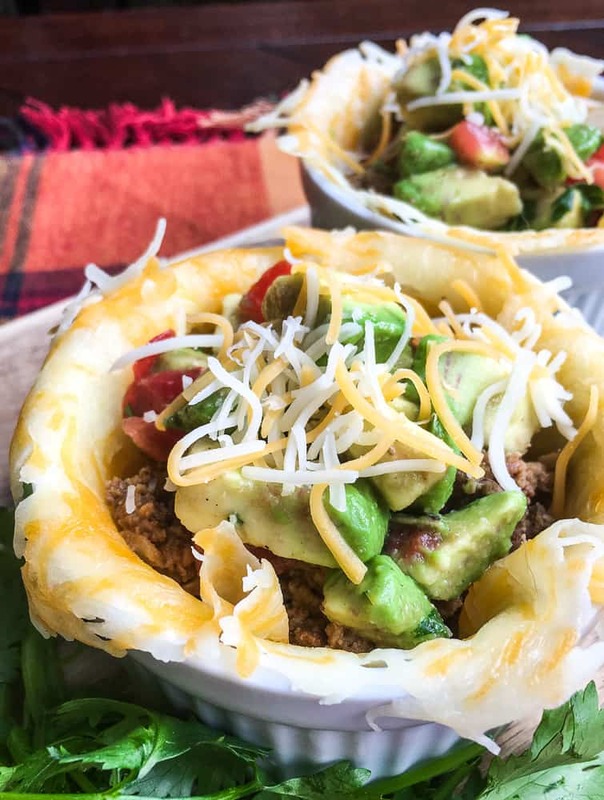 These Keto cheese taco cups one of my favorite low carb ground beef recipes because it’s filling and feels a whole lot like comfort food without all the junk. 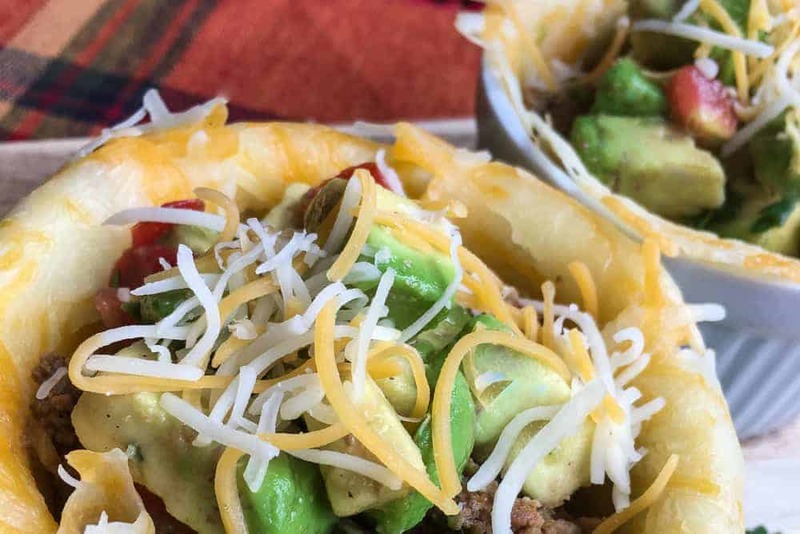 Plus, Keto tacos are just like normal tacos – just with tasty Keto taco shells made of delicious cheese. And who doesn’t love tacos?! Another reason to love this easy Keto friendly recipe is the avocado salsa. As if the Keto taco bowl wasn’t delicious enough, the avocado salsa is like the icing on the cake… but more so the salsa on the cheese cup. It’s a great way to add healthy fats into the dish and the flavor is fantastic. You might be thinking… Are tortillas Keto friendly? Why make keto cheese cups? 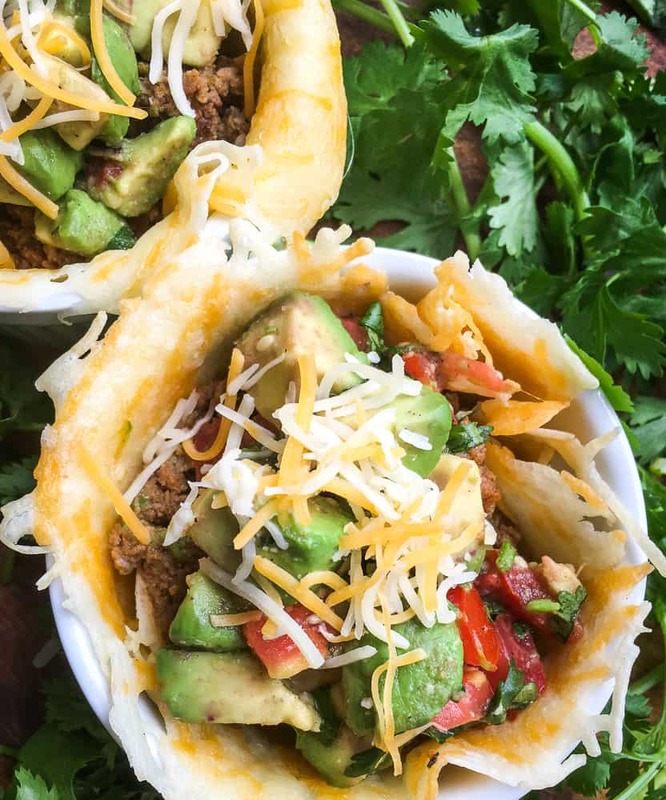 The point of making these Keto taco cups is because most tortillas are not super Keto friendly. They’re fairly carb-filled and, short of you making them at home, the ingredient list is pretty lengthy. 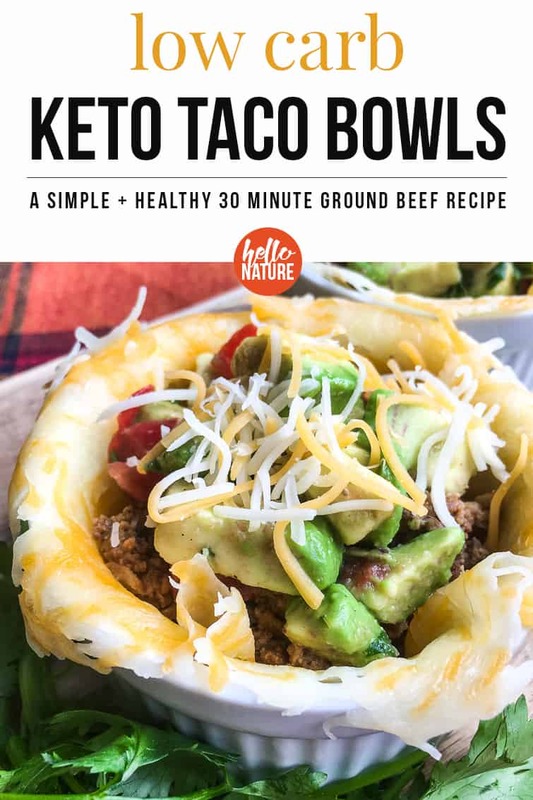 Which is why I love Keto taco shells/Keto cheese taco cups/Keto taco bowls..
There’s plenty of ways to make tacos and even nachos into an easy Keto friendly recipe. For the cheese taco cups themselves, you’ll just need two cups of finely shreddedColby Jack cheese. Super easy! For the taco filling, you’ll need: ground beef, water, chili powder, ground cumin, garlic powder, onion powder, smoked paprika, and salt + pepper. You probably already have those ingredients already, right? And then, for the avocado salsa, you need: avocado, tomato, lime juice, cilantro, and salt + pepper. You’ll also need a muffin tin or ramekins along with a baking mat. Nothing crazy! 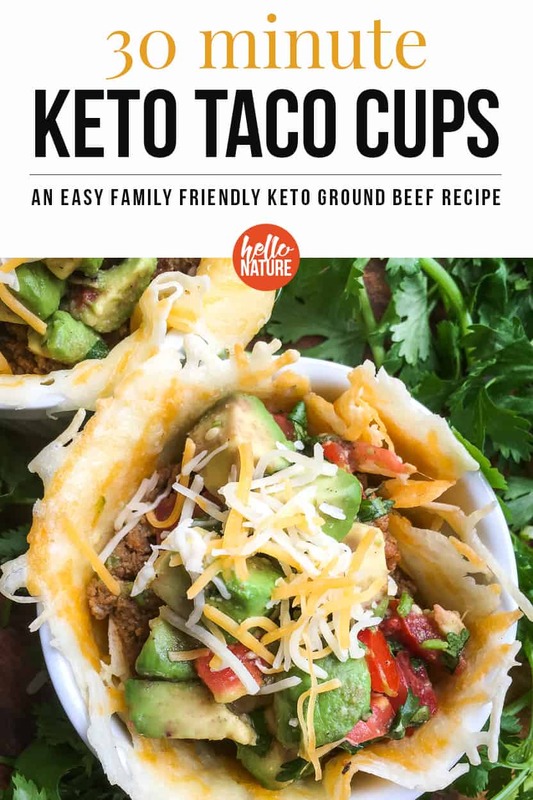 It’s truly an easy Keto ground beef recipe that is perfect for the whole family. You’ll find the full Keto taco cup recipe below in the printable card, but here are some quick tips for making the actual taco bowls/cheese cups themselves. Preheat the oven to 200F. Using a baking mat or a large baking sheet lined with parchment paper, this is how you’ll make your Keto taco shells. Set the pan aside for now. Divide 1 1/2 cups of the shredded cheese into six piles on the baking mat or parchment paper. This should be approximately 1/4 cup each. Spread each pile out into a small layer that’s circular in shape. Place the baking pan/mat in the preheated oven until the cheese has slightly melted and is growing around the edges. This should be 5-6 minutes. Remove from the oven and let cool for 2-3 minutes. Remove the cheese and press into the muffin tin or ramekin to form the taco cups. Let cool even longer until they’ve “set” and will stay the shape of the ramekin or tin to form the taco cup. Remove the cheese cups from the dish. If you’re using ramekins, you may want to leave the taco cups in the dish for extra support. The rest of the recipe is easy peasy! Cook the meat, make the salsa, fill the cups and bam! You have a healthy 30 minute meal that you’ll feel good about eating. An easy Keto friendly taco bowl recipe made in 30 minutes. Preheat the oven to 200F. Use a baking mat or a large baking sheet lined with parchment paper for the cheese cups. Set the pan aside. Divide 1 1/2 cups of the shredded cheese into six piles on the baking mat or parchment paper. Spread each pile out into a small layer that’s circular in shape. Place the baking pan/mat in the oven until the cheese has slightly melted and is growing around the edges. Approximately 5-6 minutes. Remove from the oven and let cool for 2-3 minutes. Remove the cheese and press into the muffin tin or ramekin to form the taco cups. Let cool even longer until they’ve “set” and will stay the shape of the ramekin or tin to form the taco cup. Remove the cheese cups from the dish and set aside. While you're making your cheese cups, add the ground beef to a large skillet and cook over medium heat until the beef is browned and cooked through, approximately 6-8 minutes. Carefully drain the excess grease from skillet and return to the cooktop. Add water and season with chili powder, ground cumin, garlic powder, onion powder, smoked paprika, salt, and pepper. Stir to combine. Simmer for 2-3 minutes or until warmed through. While the beef is cooking, make the avocado salsa. Combine the avocado, tomato, lime juice, and cilantro in a medium bowl. Season with salt and black pepper, to taste, and gently stir to combine. To serve, fill the taco cheese cups with beef, avocado salsa, and the remaining shredded cheese. Top with a dollop of sour cream, if desired, and enjoy!